Do I Speak His Language? A woman whom I do not know well recently and unexpectedly poured out her heart to me. It was nothing I did, it was a matter of being at the same place and the same time and having an open heart and mind attitude with her. Her story broke my heart and it was the process of one mom looking for answers from another. Out of respect to her, I will not share her pain here, but the point to be made is the importance of listening. I believe in divine appointments and looking back at the events of that day, I am certain that I was where I was supposed be according to God’s plan. Our discussions have now continued over several days. I do not presume to know where this woman’s relationship is in regard to her faith in Jesus Christ. However, I do know this. Hearing the healing words of our Lord spoken to her and over her situation, knowing that she and hers are being prayed over, and reminding her gently that God is sovereign in her situation – has given her a sense of peace when before there was none. Let me make it clear – this has nothing to do with me. It has everything to do with how God works – how He calls – how He draws others. 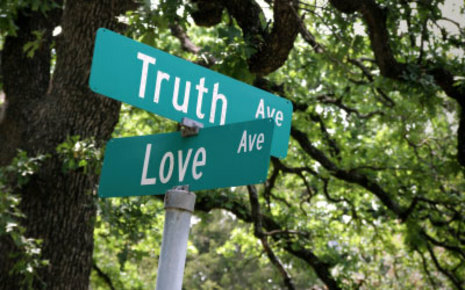 The language of God is truth and love. What I am sharing with her may be foreign to her. But it doesn’t matter because His word is truth – and we all want to know truths. It is what helps us to make sense of the non-sensible. When I was young in my faith, I would probably have been intimidated to take this kind of chance, to speak God’s word into another. After all, we are warned to not throw our “pearls” randomly about as we may be trampled for it. But in that, we must also be willing to take that chance – at least once with that person or situation. It is not up to us to settle the issue, it is up to us to be sensitive to God’s leading and to give the reason for our hope to anyone who might ask. I remember my pastor telling a story of a time when he had an opportunity to share the gospel with a bank teller. She asked him how his day was and he responded by saying ” I am blessed!” She asked him why? It was a Friday afternoon, people were lining up at the cue, he became frozen and tongue tied. God had given him a chance to tell her WHY he was blessed. But he didn’t take that chance. He still grieves that opportunity. Ever been there? I know I have. Sharing our faith can be uncomfortable – it requires us to take chances. I always feel nervous hives creep up my neck when I am called to do so. But it doesn’t matter – because this morning I am thanking God that for once, through His strength, I didn’t submit to the fear in me… and I spoke God’s language to my new friend. If all I have done is plant a seed in her, that is enough. Our God is calling her…she hears His knock and in time for her and for all of us, He will finish the good work He has started. Amen and Amen to that. Life lessons, Life Stories, Random Acts of Kindness, What Is Truth? Very well explained. It is so true…. many times it is very difficult to share the Word with others but we will never regret it. However, many times I have regretted not taking advantage of the opportunity the Lord opened for me to share the Word with others. Lord bless you!